In addition to the listings below, we have some smaller and more unusual productions for various events, both for family and adult audiences. Many of our stories are told in a combination of English and Spanish, and some are recommended for library performances (both are noted in the show's description). Feel free to contact us to discuss your event and how we might work with you to bring fine quality arts programs to your audiences. Fees vary according to production and travel, but there is something for most every budget. For hundreds of years puppet entertainers have roamed the streets in countries all over the world. They have sought to delight, amuse, reform their audiences, as well as earn their keep in society. 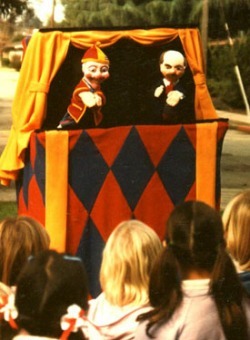 Traditional puppet characters such as England's Punch and Judy, Germany's Kasperl, and France's Guignol all evolved from humble folk origins, nurtured by these street performers. 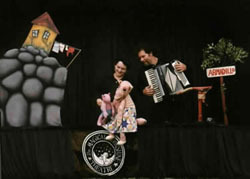 In The Puppet Man, MMT's Michael Nelson creates his own version of traditional European street theatre. The performances are colorful, lively, spontaneous and ever-changing. 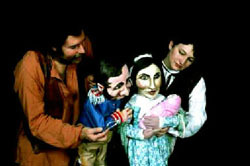 In this unique theatrical experience, the puppeteer, puppets and audience respond to each other to create the play together! This story is told in a combination of English and Spanish. This performance may be unlike anything you have ever seen before. 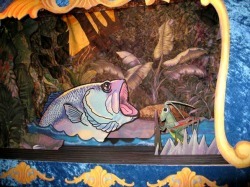 It is a recreation of Victorian Miniature or paper theatre. People have compared the beauty and miniature size of the show to a jewel; it sparkles with rich colors and a universal story. The performers have gone far beyond the simple Aesop's fable of the grasshopper and the ant to create a green-man cycle tale as in olden times, a story that takes the audience on a journey through the seasons, leading them to a new understanding of their own place in the cycle in nature. This story from Argentina tells of a wealthy Fox who tries to take advantage of a poor Armadillo, making her work his garden for him. He thinks he is getting the best part of the deal, but the Armadillo is smarter than he is at every turn and in the end succeeds in setting things right once and for all. Miss Robin Crusoe (pictured left) is the niece of the famed Robinson Crusoe. Like her famous uncle, she also finds herself shipwrecked on an island...an island, as it turns out, that has been visited by pirates in the past. The sumptuous backgrounds for the production are the results of an artistic collaboration with textile artist Meri Vahl and are comprised of an array of beautiful batiks and fabrics. In MMT's The Bear Flag Show, California history roars to life with puppets of all shapes and sizes, live music and song from the California period, and good old fashioned theatrical effects. Famous historical characters such as Kit Carson, John Fremont, and General Mariano G. Vallejo were all involved in this hilarious comedy of errors which resulted in the short-lived (26 days) "country of California," complete with it's own president and flag (the first California Bear Flag). MMT's Cirque du Cafe is a table top circus for the whole family, where salt shakers do a trapeze act, a wine bottle and a baguette perform magic, a bread roll rides a pizza cutter unicycle and a banana swallows swords longer than it's body. This is object theatre and puppetry and circus and great fun! This show was originally designed for adult audiences in the cafe setting, but since it opened in Spring of 2005 it has played very well in various forms for family as well as adult audiences, in a variety of settings, both restaurant as well as theater. With many acts, the length and age appropriateness can be adjusted. In the rain forests of South America all living things sing in harmony with each other. But then the chords of disharmony sound as drought descends upon the land. The greedy Jaguar proceeds to force the smaller and weaker animals to dig a well. Soon there is water again in the rain forest and it is controlled by the Jaguar. But there is one animal in the forest who will stand up to the Jaguar. He is the Rabbit. Armed only with his humor and wits, he alone dares to challenge the Jaguar and his henchmen until justice prevails and the balance of nature is restored. In The Jaguar's Fountain the puppets and scenery have their own musical sounds created by a variety of hand crafted non-traditional as well as traditional instruments. Recommend for children ages 4 and up. The Recycling Show focuses on the whys and hows of living on earth in our age of consumption. The entire stage for this show was made from recycled materials. Because recycling regulations often differ from county to county, MMT researches recycling facts and statistics for each county before they perform this show. In the Native American story, Coyote Sings, the crazy buffoon, Coyote tries desperately to learn a song. This combined with his bungling attempts to hunt for food and impress all his neighbors with his personal skills make for hilarious slaps tick. Southwest motifs and designs and Mexican folk tunes make this bilingual show a very poplar addition. Shadow puppetry creates a mysterious and wonderful world where color, light and story enthrall adults and children alike, belying its simplicity. Using both black and illuminated shadows, MMT presents literature and folktale inspired stories from around the globe. From the Rudyard Kipling "Just So Stories", The Cat That Walked By Himself makes a deal with the first humans to share their cave on his terms. In this African American trickster tale, the clever Br'er Rabbit plays a trick on Br'er Bear, and steals his fish from him. Br'er Fox watches the whole trick, but when he tries it himself his efforts end in disaster. Once again Br'er Rabbit survives by relying on his wits. 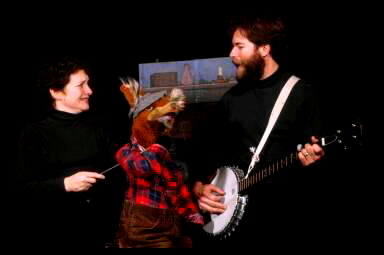 The story is told with large, direct-manipulation puppets, live banjo music and singing. This story is a Southeast Asian Folktale from the Hmong people. Long ago a wise, old man lived with a Bear, a Tiger and a Dragon. One day the animals all set out to try to scare one another by seeing who could make the greatest commotion. When the man finally took his turn, he used his brains to teach the others a lesson. He scared the animals so badly that bears, tigers and dragons will no longer live with people. 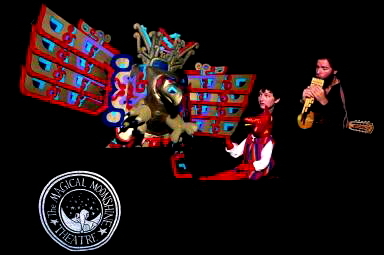 The story is presented with shadow puppets, masks, and live music played on a variety of SE Asian musical instruments. In this story a fox and elk decide that they are not happy with the way they are made, so they decide to switch arms and legs with each other. The fox, now with very long arms and legs, finds that she can no longer hunt, and is in danger of starving. The elk with the short fox arms and legs can not reach the leaves on the trees that he is used to eating. Both finally realize that they were much better off the way they were originally and in the end exchange arms and legs again, happy to have their old limbs back. The story is humorously set to popular U.S. music of the 50s. It is told that long ago when the earth was new, the people of California were cold because they did not have fire. They went to Coyote for help and he organized Bear, Mountain Lion, Rabbit, Squirrel, and Frog to help steal fire for the people. 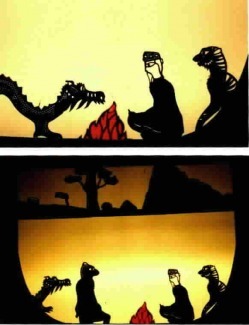 MMT presents this native Californian folktale with shadow puppets and music. Native Americans of the Western part of this continent tell many stories about the trickster, Coyote. In this story from the plains states, Coyote plays a trick on the ungrateful Grizzly Bear, thus saving the life of Mountain Ram. Although presented as a Native American folktale here, the theme of this story is universal, and appears in tales from many cultures around the world. This folktale is told with masks and Native American drum. Once again Brer Rabbit finds himself in a precarious position when he thinks his luck has run out and he seeks advice from Mammy Bammy Big Money. Her magic shows him his luck is in his wits and not in his lucky rabbit's foot. 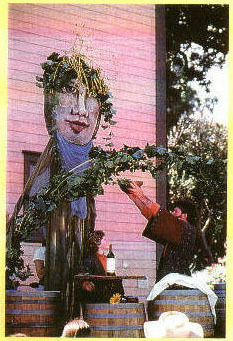 First comes a symbolic creation of Napa Valley (or Sonoma Valley, Central Valley, etc. ); great seismic forces shift rocks, sand and wood in a symbolic geological tableau. Following is the purification of the ceremonial grape knife, and the harvest of the grapes, the crushing of the grape to juice, and the offering to the four directions. When the offering is given to the Earth, the Spirit of the Vines (an animated figure made of natural grape vines) is awakened. At his touch the bounty (and the bottle on the altar) overflow, as red wine fountains down over the altar in abundance. The blessing is complete with offerings of music and poetry shared with the celebrants. Another Native American folktale, Coyote Runs, Coyote finds his efforts to fool his neighbors backfire as he is outwitted by a lizard, a badger, a rabbit and a rattlesnake. But as always, Coyote prevails, himself outwitting death to the joy of his loving wife. Another trickster, Brer Rabbit comes to us from Africa, but has settled right in to American Folklore. 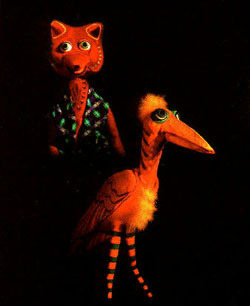 In this puppet tale, Brer (short for Brother) Fox decides to plant a garden, and Br'er Rabbit decides to help himself. The fox decides to set a trap for the rabbit but Brer Rabbit is one rabbit who can take care of himself, and Br'er Fox does not end up with the prey that he bargained for. This Afro-American Br'er Rabbit story tells about how one day a lion moved into the forest and started eating all of the other animals. Br'er Rabbit sets out to get rid of the lion with his usual trickery, and succeeds in getting rid of the l ion and becoming the hero despite the lack of help from Br'er Fox and the other animals. This story is told as a story within a story; a roving puppet troubadour is telling the tale when the "real" Br'er Rabbit stumbles upon the play and begins to take over. Complications ensue when the real lion shows up instead of the puppet lion. Told with live folk music and singing. July 4, 2007 Marked the 200th birthday celebration of General Mariano Vallejo, who lived in Sonoma, California. The city of Vallejo, California is named after him. 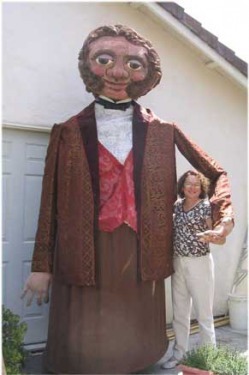 To celebrate, the cities of Sonoma and Vallejo commissioned MMT to make two giant Vallejo puppets to walk in parades. 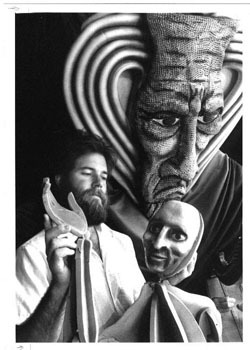 We made the puppets very light and airy so the puppeteer inside would be as comfortable as possible. By the end, the puppet weighed about 17 pounds. 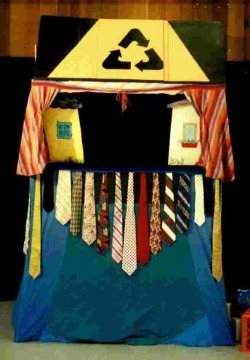 It also had a structure inside of it that allowed the puppeteer to stand the puppet on the street and rest, not holding the weight of the puppet at all. A one-run-only dramatic theatrical production based on the myth of Orpheus. Choreography and story adaption: Michael Nelson. Music: David Auerbach. Text: Steve Tillis. 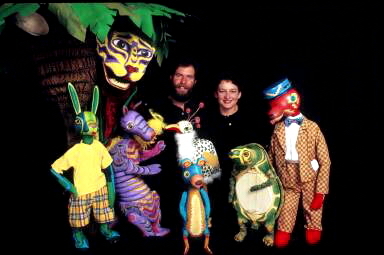 Puppets: Michael Nelson, Kamela Portuges, Lee Armstrong, Michael Wick. 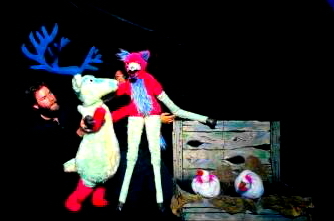 December 2009: The Night Before Christmas- This handpuppet production was a recreation and celebration of the very first production that MMT performed in 1979. The premise is that a group of puppets attempts to act out the Night Before Christmas with mixed success. As this show is a seasonal offering, please call for availability.